Today would have been Gabrielle "Coco" Chanel's 128th birthday. Oh, and it's also my birthday, which you'll have to forgive me for thinking is pretty cool. See? I really do need that 2.55 handbag in my life! For now, I'm satisfying my Chanel desires by wearing the aptly named Chanel No.19 Poudre which was kindly gifted to me when I recently visited Chanel HQ on Old Bond Street. Chanel No. 19 Poudre is a variation on the classic No. 19 fragrance, which was the last perfume Coco Chanel was involved in the development of back in 1970 just before her death. No. 19 is named after her birthday on 19th August as Chanel herself explained, "It is the day of my birthday, August 19. I was born under the sign of Leo- the lion. I will bring out my claws to protect myself against being hurt. But believe me, it is harder for me to lash out at someone than to have someone lash out at me." It is presented in the instantly recognisable, minimalist Chanel bottle whose iconic status was cemented when Andy Warhol featured Chanel No.5 (presented in the same way) in his screenprint series. It's a design which practically screams out to be displayed on a traditional dressing table and something which feels very special to use. Being an EDP, I found the scent long-lasting on my skin. The classic No. 19 is based around the signature note of Iris, along with bold yet fresh green notes and No. 19 Poudre stays true to this heritage. In fact, even the liquid itself is green in colour and is reminiscent of the August birthstone, Peridot (also the name of Chanel's hot new shade for AW11, on counters today). The initial blast of scent is fresh with top notes of Grasse neroli and Mandarin. The heart is formed of Iris Pallida, keeping it evokotive of the original, along with Jasmine Absolute which makes it unmistakably Chanel. The base notes are a stunning blend of White Musk, smoky Haitian Vetivert and creamy Tonka Bean. Apparently iris is diffcult to source and work with, keeping with the luxury theme. 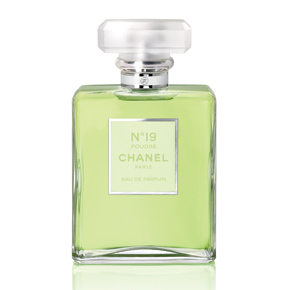 The powdery finish adds a modern twist to Chanel No.19 and makes it accessible to a younger generation. Having said this, it remains an elegant scent in the way that Chanel fragrances capture so well and demands to be accompanied by a polished appearance albeit with a witty sense of fun. I'm going to admit something controversial now and say that I actually find No. 19 far more wearable than Chanel No.5. I like that it gives you a touch of Chanel without being as instantly recognisable as the iconic No. 5, I like to keep people guessing when it comes to fragrance after all and the new twist certainly appeals to me. Of course, given the fact that it contains my beloved Vetivert perhaps it's unsurprising that I've joined the ranks of Chanel No. 19 fans. I'll be wearing this in celebration of our shared birthdays as well as beyond today. Chanel No.19 Poudre costs £61 for 50ml Eau de Parfum.